The baby with an early brain injury recovers during a period of exuberant neuroplasticity. 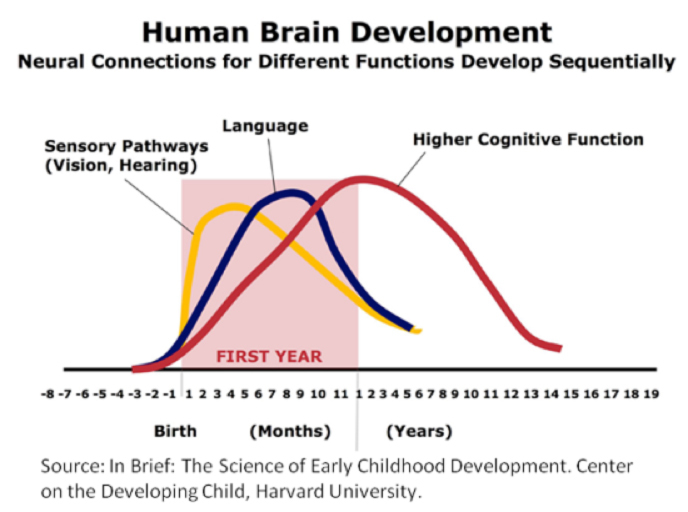 In order to encourage both brain development and recovery, it is important to understand how a normally developing brain grows and matures into functional capability. Early areas of functional development include sensory (touch, feel, taste) and hearing. Both are active in utero and rapidly mature over the first year of life. The visual system also ramps up rapidly after birth and reaches functional maturity by age 3 to 4 years. The normally developing child also learns all the basic fine and gross motors skills by 4 to 6 years. Further development and maturation can be considered advanced skill training. This rapid development of function has been traditionally measured by brain weights. Baby brains double their weight by 6 months, reach 75% of adult size by 2 years and 90% by 4 to 6 years. Functional MRI brain imaging has shown that simple brain weights are only the first step in a series of complicated processes that are only fully mature at 20+ years in females and 30+ years in males. For the baby born early or the full term infant with a complicated neonatal period, the first years may be complicated by a brain injury. From what is known in adults with a stroke or a teenager with a brain injury, the spontaneous recovery period seems to be 3 to 4 years. The adult with stroke regains a lot of function, at a fairly rapid rate in the first 6 to 12 months. After that, gains are slower, but still significant for a further 2 to 3 years. Change is still possible after 4 years, but it requires more work and therapeutic help. This is in a mature brain with well-established movement and speech programs. The situation is very different in a baby who has to both grow their brain and recover from the damage. The question is, “How can we help?” The primary requirement is to sleep and to eat – both are needed to grow and recover. In the first days of life, babies can hear and respond to voices and music. There is some evidence that repeating sequences that are soothing and restful may be helpful background stimulation when awake. Those that study music commonly recommend the music of J.S. Bach and there are a wide variety of products available and videos on YouTube. This is a cute one. I am not in the position to validate any claims of improved brain function, but if the baby quiets and seems to be soothed by a music piece, this is good for the brain. Linking music to movement, your voice and/or gentle massage can also start early. There are established infant massage books and courses for parents as well as a wide variety of baby play idea books. Just enter the key words on Amazon or Barnes & Noble for a selection. Again, things that are enjoyable for you and your baby, help the brain grow and recover. In my experience, many times the parents are so afraid of damaging their fragile newborn, the babies are actually deprived of normal interaction and play. If the baby has a visual or hearing problem, it is even more important to use what works to help the brain learn and recover. It is well known that visual acuity, hearing and motor movements improve over the period of recovery, but it still needs to be helped along with gentle, enjoyable stimulation. Remember, babies also need sleep and have short attention spans! As the baby grows, there may be increased or decreased tone that inhibits normal function and learning. Pathways.org has free videos of normal and abnormal baby movements that are a great help for first time parents, as well as age appropriate games and activities to stimulate development. The next post will discuss ways to support alignment during activities in the baby and toddler to both maximize neuroplasticity and minimize maladaptive habits. Interesting read but I guess a lot of it went over my head. Can you make like, an infographic or something so that it can be understood better?